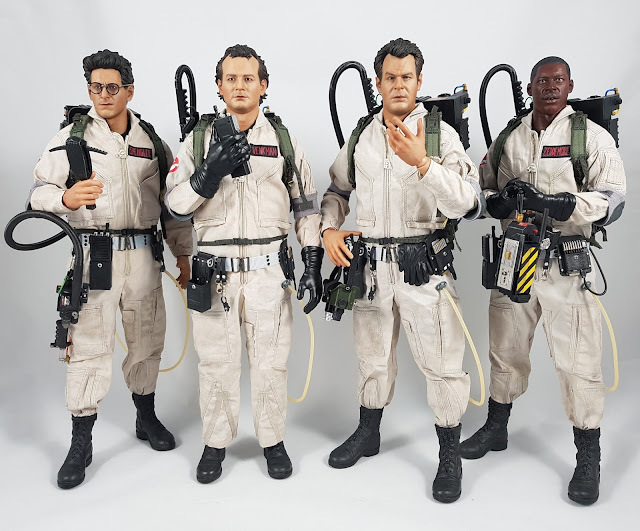 When Blitzway first announced that they would release the Ghostbusters characters from the classic 80s action comedy, collectors world wide were very excited. It's great when 1/6th scale companies tackle characters from these sorts of movies instead of the usual mainstream stuff. After months of delays, the set was finally released in late 2017, and overall were definitely worth the wait! There are a few nits to pick too, and I go through all of that in my video review. Click through below to check out the video over on the Kool Kollectibles YouTube channel! 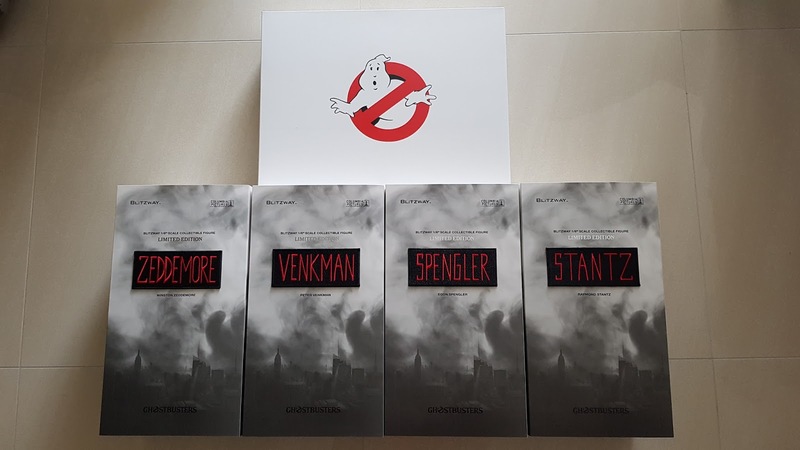 I ordered the Special Pack that came with the four main characters, Slimer, and the diorama police barricade. 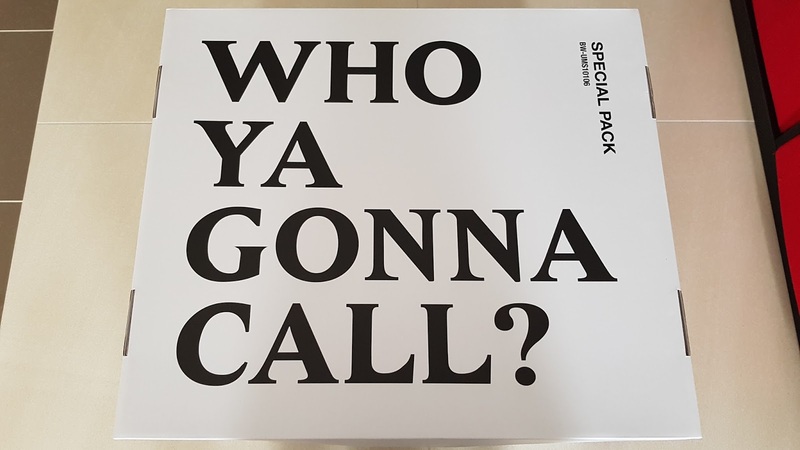 They were all packed in one massive box, with their classic call tagline on top. Very nicely done! Opening the main box reveals the 4 figure boxes and the separate box for the Special Pack accessories. The main figure boxes are done in a very classy way, with real fabric name plates stuck to the front box art. Note that these are not held on by velcro, but some type of glue. Each figure essentially comes with the same set of accessories, with a few minor variations between characters. Stantz comes with the ghost trap and googles, Spengler comes with the PKE meter, Venkman comes with folded gloves and cigarettes, and Zeddemore comes with the ghost trap and cigarettes. Each of course comes with the proton pack, which is extremely detailed. 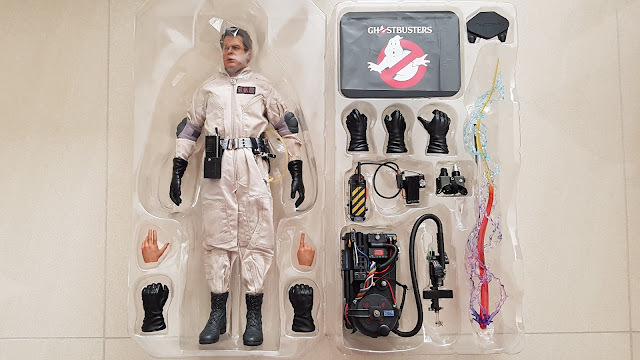 I didn't check how movie accurate it is, but overall it looks fantastic. Note that the backpack is very fragile, with lots of parts that can break off. I almost made it through assembling all the figures without breakage, until I got to Zeddemore. 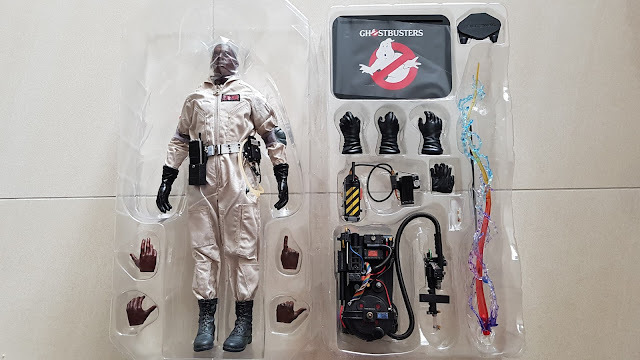 I must have placed my hands in the wrong spot just once, which broke off the little silver antenna piece on the proton pack. Luckily I was able to superglue it back on. 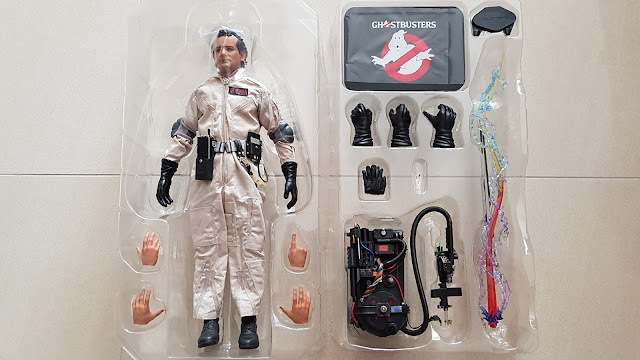 They all come with an assortment of gloved and ungloved hands. The proton blast effect is also included, and can be attached to the tip of the wand for that shooting effect. I've kept that box as I don't intend on ever using it. The last accessory to mention, and will never be mentioned or used again, are the absolutely ridiculous stands that are included. I am not sure what Blitzway was thinking in the design, but the whole assembly and use of the stands just does not work! With the proton packs on, the stand simply gets in the way. The standard Hot Toys crotch grabber is all that was needed, but the stand design they've developed is simply a waste of a nicely printed base! The support mechanism is just terrible. Straight out of the box, the figures need a lot of futzing to look decent. The utility belts are placed too high up on the waist, so need to be taken off and loosened. 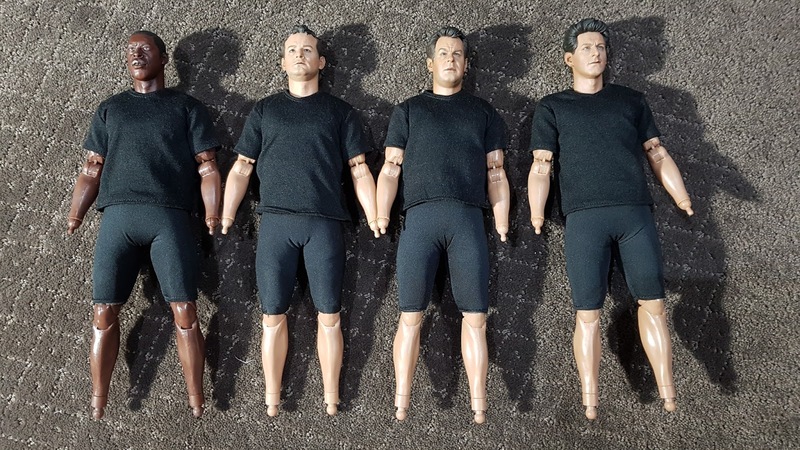 The outfits themselves need a bit of water treatment too to loosen them up so that they look more natural on the figures. I took everything off slowly and carefully, and was then able to futz all the accessories in slow time. I rearrange the hooks on the belts to be more accurate to the movie and give a bit of variation to each character. It takes a long time, but I think for figures like these it's all worth the time. 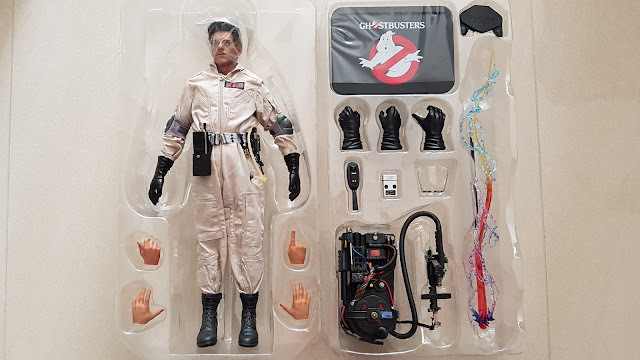 Placing the proton packs onto each figure is a slow and tiresome process because you're so worried about breaking something. The clasps that go around the waist were of particular concern, with lots of reports of breakages. To minimise the risk, I dipped both ends of the clasp in boiling water to soften the plastic. I managed to clip all the proton pack straps on without breaking them, which was great. The shoulder straps need adjusting too, so just vary the length to try and get them to support and hang on the shoulders as naturally as possible. Once all setup, the team certainly looks fantastic together. I do think Blitzway definitely need to improve on their facial paint application though. The head sculpts are pretty good, but let down by a lack of detail and subtle shading variation in the paint. Zeddemore is definitely a shade too dark which hides the sculpt detail. I also think his sculpt is a fraction too small. The other three have decent sculpts too, with Spengler being my favourite. 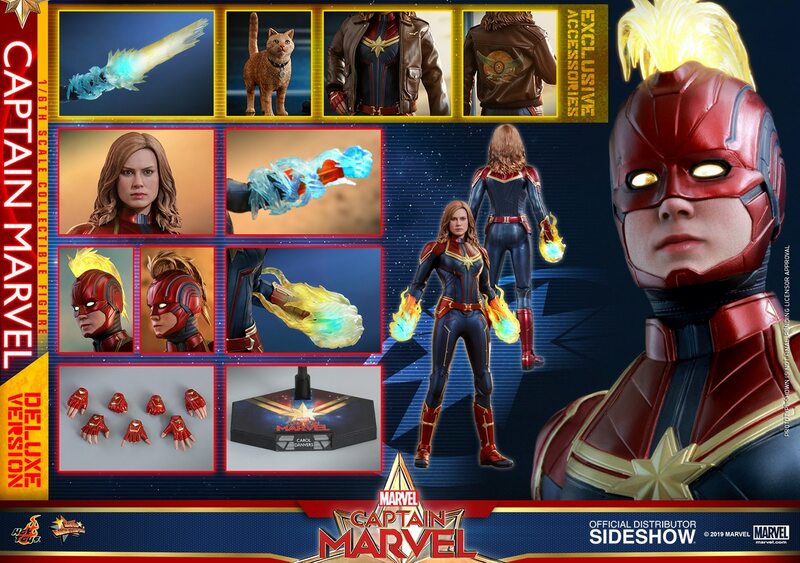 But each has a very flat paint app that gives the face a somewhat plastic look without the needed realism that Hot Toys has. I've seen some repaints on the forums that proves the sculpts are great, so if only Blitzway had done better in that area, these would have been figures for the ages! As they are, the figures are still an awesome set to have. The articulation is generally OK, and the variety of accessories certainly gives you all the pose options you would want in your display. With pretty good likenesses all round, these will be classic characters that you'll gladly show off in your collection for many years to come. 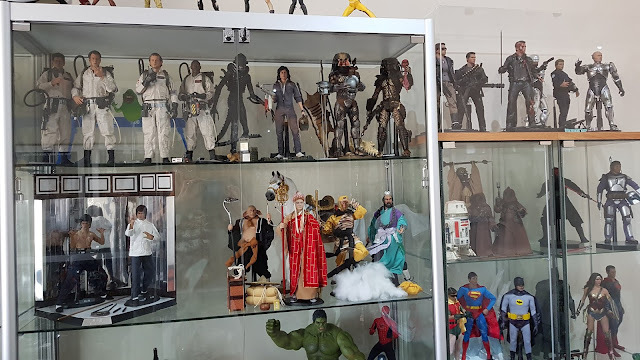 They certainly look great with other classic action/sci-fi figures!